At a public meeting on November 22, seven of the city’s biggest developers unveiled competing plans for a hotel and condos in what are currently two empty parcels sandwiched between Pier 1 and Furman Street (the two will be separated by a courtyard and a pedestrian bridge over Furman Street up to Squibb Park in the Heights). The proposals feature designs that would have 150 to 180 condo units and 170 to 225 hotel rooms. The larger parcel will feature a building with the hotel, some residential units, and a restaurant/cafe, and can be no taller than 100 feet; the second parcel will contain all residential units and must be 55 feet or less in height. You can download a PDF of the formal presentation here. The developers are Dermot, Extell, RAL, SDS, Starwood Capital Group, Toll Brothers, and the DUMBO-based Two Trees. The real estate website CURBED has previews of each design, and conducted a poll of the readers’ favorites. CURBED has extensive Brooklyn Bridge Park coverage here, including news on new construction beginning in January–a picnic area on Pier 5 and the Squibb Park pedestrian bridge–as well as the park’s failure to receive any bids for a “winter bubble” for recreational activities on Pier 5. A LAND BRIDGE FOR GOVERNOR’S ISLAND? A new research group at Columbia University, the Center for Urban Real Estate, headed by innovative urbanist Vishaan Chakrabarti, proposed the creation of a new Manhattan neighborhood, “Lower Lower Manhattan,” by filling in a land bridge between the Financial District and Governor’s Island. Chakrabarti unveiled this radical idea at a day-long conference entitled “Zoning the City” on November 15. The massive amount of dredging that the Army Corps of Engineers has to do over the next fifty years to keep the harbor’s shipping channels at a proper depth would provide the needed earth. The city’s strict regulations about building on landfill (passed after the construction of Battery Park City, which used earth from the original WTC to expand the shoreline) makes the idea highly unrealistic. The idea sounds a bit less far-fetched when place in a global context. Chakrabati notes that such techniques have been used in Hong Kong and other global cities to great success, and that New York needs to consider such options to stay competitive. 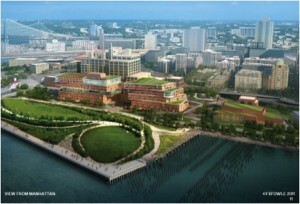 The project would also include a bridge to Governor’s Island from Red Hook. For more details, check out this New York Times piece detailing the proposal. BROOKLYN-STYLE WATERFRONT DEVELOPMENT ON STATEN ISLAND? In November, New Jersey developer Ironstate–a firm that has done much work along the Hoboken and Jersey City waterfronts–signed a deal with the city to create 900-unit rental apartment complex at the Homeport, site of a former naval base in the Stapleton neighborhood (the Navy left in 1993). A somewhat opinionated Times piece that discusses this development in terms of Staten Island’s supposed “image problem” can be found here. 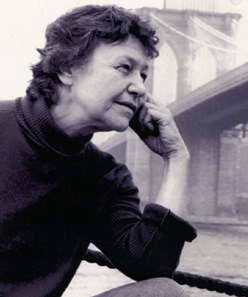 Brooklyn waterfront pioneer and violinist Olga Bloom passed away on Thanksgiving Day. Her vision of using an old coffee barge as a 150-seat venue for chamber music certainly seemed a bit bizarre along the forlorn Brooklyn waterfront of the 1970s. But the space soon evolved into one of the premier venues in the city. For a brief but lovely appreciation, see this Times piece by longtime reporter Francis X. Clines. Crain’s New York published this reevaluation of Mayor Bloomberg’s failed effort to obtain the 2012 Summer Olympics for the city, not surprisingly written by Jay Kriegel, the former head of the NYC2012 effort. The piece relates the findings of a report by NYU’s Rudin Center for Transportation Policy and Management that reveals that most of the rezoning goals linked to the bid have been accomplished, notably those that fostered the redevelopment of the Greenpoint and Williamsburg neighborhoods. Kriegel may be an uncritical cheerleader for these developments, but he does bring up a forgotten but important aspect of the mid-aughts building explosion. Perhaps the biggest Brooklyn waterfront news of Fall 2011 was the forced removal of American Stevedoring Inc. (ASI) from the Red Hook Container Terminal at the end of September. As it turns out, ASI owner Sal Catucci has had a rough relationship with the Port Authority since the company started operations on the site in 1992. ASI had not paid rent since the renewal of a ten-year lease in April 2008, claiming that the lease had been signed under duress. ASI has pursued a lawsuit contesting the lease. For more details, see this report in the Red Hook Star-Revue by George Fiala (the link will open as a PDF). We here at the BWRC are thrilled by the new BLDG 92 Brooklyn Navy Yard Center, a museum that opened on Veterans’ Day, Friday, November 11. The Center is housed in the the four-story Building 92, which consists of the former Marine Commandant’s Residence with a newly built glass and steel annex. It also houses a Resource Center, which contains the Navy Yard’s archives, which are open to scholars. 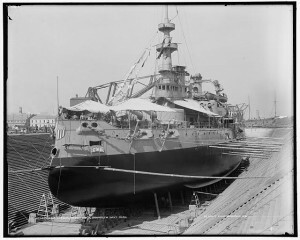 Much of the first exhibition, “Brooklyn Navy Yard: Past, Present and Future,” focuses on the site’s career as one of the U.S. Navy’s premier shipbuilding yards from 1801 to 1966. It also features information on the site’s pre-colonization inhabitants, the Lenape Indians, who sold the land to the Dutch in 1632, as well as some exhibits relating to some of the 240 businesses that now occupy the Yard. The Center is free and open to public Wednesdays through Sundays, 12 to 6pm. You can take a two-hour bus tour of the Yard for $30, a one-hour version for $18, or a bike tour for $24. You can read a Times story about BLDG 92, a more historically minded piece at the New York Observer, and a short piece in The L Magazine that features a slide show. 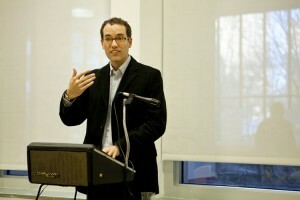 Our Breakfast Talk series had a strong start on Friday, November 18, when Evan Hughes came to discuss the relationship that many of the writers that he wrote about in his book, Literary Brooklyn: The Writers of Brooklyn and the Story of American City Life, had with our borough’s waterfront. About thirty folks came out at 8:30 am to hear Evan speak and enjoy some coffee and danish. In Evan’s talk, one locality that came up again and again–from Hart Crane to Norman Mailer–was the infamous “Barbary Coast” just outside of the Navy Yard, especially along Sands Street, a now forlorn strip cutting through the Farragut Houses and under the BQE. 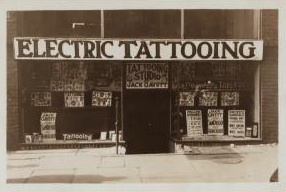 Saloons, brothels, and tattoo parlors lined the street. Several of Hughes’s subjects could not resist the pull of “authentic” working-class life that they found there. We thank Evan again for his fascinating presentation. Look back here soon for details on our next Breakfast Talk in February.